Sacramento, Calif. – Today, Multi-platinum selling and Grammy Award®-winning rock band, Maná, today announced they will embark on their most influential tour yet - THE LATINO POWER TOUR. Produced by Live Nation, the tour kicks off on Fri. Sept. 9 in San Diego at the Viejas Arena and will head to Northern California on Saturday, September 17 at SAP Center in San Jose and Wednesday, November 9 at Golden 1 Center, the new home of the Sacramento Kings in Downtown Sacramento. A full list of tour dates is below. Tickets go on sale starting Friday, February 19 at 9 a.m. at LiveNation.com. Fans with the Live Nation mobile app will have access to a password-free presale starting Thursday, February 18 at 10 a.m. local time. The pre-sale opportunity is only valid for shows at Ticketmaster-ticketed venues*. The app is available via the App Store and Google Play. As Latin Rock's most engaging arena-level live band, longtime cultural ambassadors and powerful social advocates, Maná, will take 80 tons of state of the art concert production gear to the road across the United States with the goal of uniting and inspiring Latino communities to make their voices heard this fall. "We have baptized our new tour "Latino Power," because with the strength of their collective vote this year, U.S. Latinos can further empower our community - demanding more respect and affecting real change in the living conditions and opportunities for our people" - Fher Olvera of Maná. Having formed in Guadalajara, Mexico in 1986, the quartet of Fher Olvera, Alex González' Sergio Vallín and Juan Calleros have gone on to be global envoys for the Latin Rock genre, while selling over 40 million albums. To date, Maná has been recognized by their musical peers with four GRAMMY and eight LATIN GRAMMY Awards. 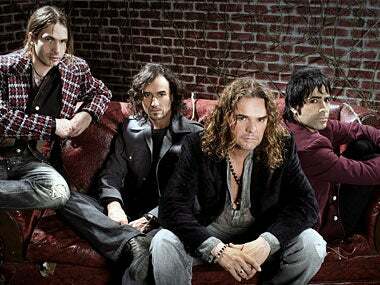 Here in the United States, Maná holds and impressive nine #1 albums and ten #1 singles -more than any other band in the history of Billboard's "Hot Latin Songs" chart). Maná is also unquestionably the top-drawing all-Spanish language concert band in the U.S. -with notable attendance records to their name, and the New York Times declaring the group has: "Redefinied 'Crossover'in Latin Pop... with its mix of love songs and more pointed political material about immigration and the environment, ...Maná has a mass appeal nearly unrivaled in the Latin pop world." For The "LATINO POWER TOUR," Maná will be sharing a new production that will be combining their greatest career hits, latest chart-topping songs from their Latin Grammy winning Cama Incendiada álbum, and uniting fans with organizations like Voto Latino and local advocates to provide both the inspiration and information needed to have their voices count come November. About Live Nation Entertainment: Live Nation Entertainment (NYSE: LYV) is the world's leading live entertainment company comprised of four market leaders: Ticketmaster, Live Nation Concerts, Artist Nation Management and Live Nation Media/Sponsorship. For additional information, visit LiveNation.com.